1. Preheat the oven 200C, gas mark 6. Put the squash and apple on a foil-lined baking tray and dot with the coconut oil or butter. Roast for 30 minutes, turning halfway through, until tender and caramelised at the edges. 2. Meanwhile, make the walnut topping. Melt the coconut oil or butter with a pinch of sea salt and cinnamon in a frying pan. Add the chopped walnuts, stirring to coat, and toast gently for 6-8 minutes, until golden and crunchy. 3. Blitz the squash and apple in a blender with the cinnamon and 200ml coconut water until smooth. Keep blending in a little more coconut water until you have a thick, smooth mousse (you may not need to use all the coconut water). Chill in the fridge for at least 20 minutes to firm up. 4. 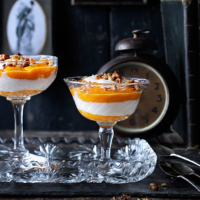 To assemble, spoon 2 tbsp mousse into the base of a glass, top with a dollop of yogurt and repeat. Sprinkle over the walnuts and drizzle with honey, if liked.